This is a lovely little "mash-up" of the wild west genre and sci-fi thriller, which may appeal to fans of the Cowboys and Aliens, Alien films and steampunkers. This is a bold move by Mongoose to use their Traveller system, deviating from traditional Traveller products as it adapts the mechanics and ramps up the equipment details to root players in a Wild West setting - as opposed to just applying generic backwater world "Low Tech Level" brush. Many years back I remember playing a character in a GDW Traveller game which was based in the Aliens films, and suddenly the shotgun had extra significance because that was a "back-up" weapon in the film. Usually in games like Traveller and Time Master weapon definitions seemed defined by their comparative limitations to the high-tech weaponry, create a concept of equipment or resource-"lack" when a new setting is applied to a what could be a universal system (does that makes sense? Redactive semiotics?). For many years I was suspicious of the GURPs core rules because I favoured games primarily based on genres/settings as opposed having universally applicable core mechanics. Funnily enough I find myself revisiting these ideas "universal (customised) vs. pure setting" every time I look at Chaosium's BRP and multi-genred Savage Worlds game. The answer, of course, is a good, is to publish well fleshed-out settings supplement (the irony here, is that Palladium and several other publishers in the 80s used the similar systems throughout their games but the games were sold on setting, not the system - well, sort mostly). If you're a loyal fan of the imperial galactic "feel" of the Classic Traveller canon, this might not appeal as a Traveller product per se, but if you like the Mongoose Traveller system and have a relaxed approached the gaming you will possibly enjoy the extra gloss and grit of cinematically style cowboys and their feisty female companions. Come to think of it, Firefly isn't that far of all of this, aesthetically speaking only, but we're really talking about Cowboys and Aliens, or a Western with a two-way Alien ("Xenomorph") hunt - not a backwater colony beyond Federation Space - this is firmly Wild West Earth Pulp. As well as adventure details (the "Town of Bent River"), there's even the class / career of "Desperado" and a bunch of fully equipped pre-generated characters which actually makes this a "pick-up-and-play" supplement in my book. Even your horse can have a personality quirk - which reminds us that horses in some ways are NPCs or hirelings with relationships to the characters in their own special way. Not to mention the fact that horse-riding can be dangerous in itself - but this is optional stuff. It's a great little supplement (50 pages), and if you don't own any games with Western/cowboy settings, there's a fair about which can be "mined" for other systems. My other almost-gripe is the price. I was pretty curious about this product and was really happy to receive a review copy. Although I'm not currently playing a Traveller campaign, my curiosity was prepared for be to spend maybe 5-6 dollars at the most for a PDF. $9 makes sense if you think about it as a campaign sourcebook as opposed to just an adventure - it's sort of a springboard with benefits - much like an introductory scenario - I haven't check the price of the hardcopy, I guess $9 is a fair price. 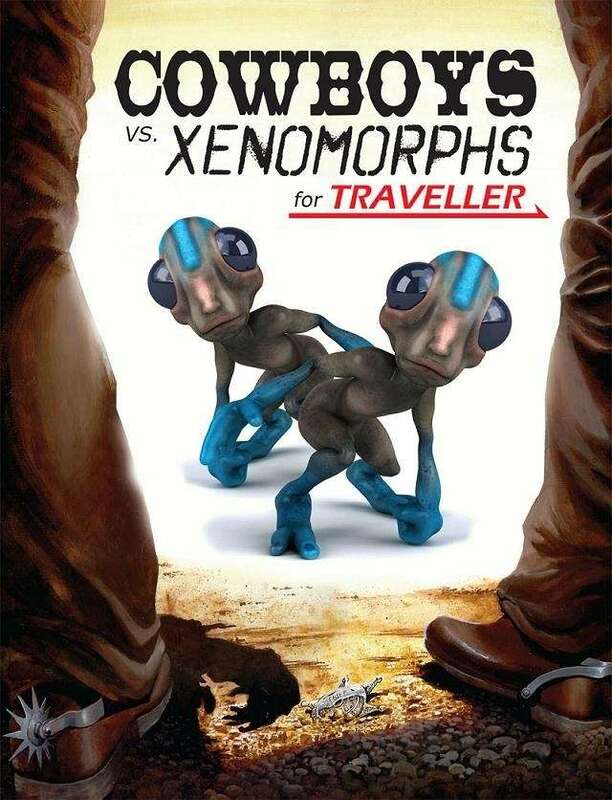 If your enthused by Traveller and Cowboys and Aliens (or Alien but with a lot of dust) this is a must-buy. If you think you can do something like with you're own choice of system, there just might be the odd little detail which will improve your game. Full marks for ambition and style!